Looking back, it’s hard to recall how revolutionary iPods were when they hit first hit the shelves 15 years ago. We’d been struggling with Walkmans and Discmans for years — cassettes could only hold a handful of music, and CDs skipped every few seconds. iPods changed everything. Suddenly, we could walk around with 10 GB of music in our pocket. Remember, this was at a time when services like Napster and LimeWire were king 5 Incredible Tech Lawsuits That Shaped the Digital World 5 Incredible Tech Lawsuits That Shaped the Digital World Lawsuits play an important role in shaping the direction of technological developments, even in the world of software. Here are a few cases that were so important, we're still feeling the effects today. Read More . It was heaven. Sadly, any music aficionado Are You an Audiophile? These 10 Questions Reveal the Truth Are You an Audiophile? These 10 Questions Reveal the Truth You might think you are an audiophile, but in reality very few music lovers tick all of the necessary boxes. Are you really an audiophile? Or are you just a great pretender? Read More who saw the recent news about the discontinuation of the iPod Nano and iPod Shuffle Apple Kills the iPod Nano and iPod Shuffle Apple Kills the iPod Nano and iPod Shuffle The iPod is no more, with Apple discontinuing both the Nano and Shuffle. And with that another piece of tech falls to the mighty smartphone. Read More likely shed a tear. These were the last vestiges of the original iPod (the Touch doesn’t count, it’s a watered-down iPhone). 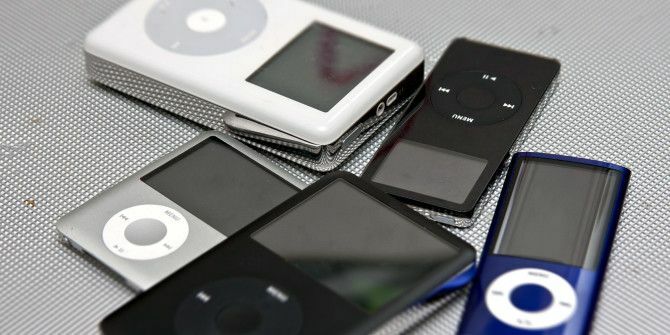 If you want an iPod as a piece of tech memorabilia to remember forever, time is running out — but it’s not too late yet! Here are three places you can still buy an old-school iPod. Not only is Amazon still stocking the recently-killed Nano and Shuffle, but you can find even older stuff. I found a 5th generation iPod with 80 GB of space for $229 and a 7th generation iPod with 170 GB for $399. You can pick up a Nano for around $150 and a shuffle for around $100. If you buy your device on Amazon, you won’t be buying from Apple directly, which means no purchase protection. If you want to reduce your risk a bit, check out Best Buy, which stocks the 8th generation 16 GB iPod Nano for $149 and the 6th generation 2 GB iPod Shuffle for $49. If everywhere else has run out by the time you’re ready to buy, check GameStop. A refurbished iPod Nano is $89 and a refurbished iPod Shuffle is $29. Will you be buying an iPod for old time’s sake? Let us know in the comments. The IPOD CLASSIC is the best portable music system I can imagine. When it went obsolete, I found a 2nd one for double the price but bought it so that I'd have a spare when mine dies. I can't live without it any better than I could live without the music I have collected which is all on there for my delight! Almost 50 gigs so far and I still have hundreds of CD's to download to my 'obsolete' 2009 MAC running El Capitan and never going higher! I hate the notion of streaming music, I use a flip phone when I'm out and about, I'll never store an iota of anything is some amorphous CLOUD, and that's that. I may be a bit peculiar these days, but I'm happy and have reached my limit re technology. Fortunately, I don't think I'll outlive my 2nd IPOD! There are some real benefits these days to being old!!! Don't. It's junk anyways, as the ipad nano does not allow for Apple music transfer, icloud accounts or even app share to be used. No Spotify - no music subscription. Thus, forcing the owner to purchase any songs they require even though an apple music subscription is already in place. Better off looking around for another mp3 player. In the course of turning my son's former bedroom into my office I unearthed my original 1st gen nano. It still works. Now it's my car music player. Only 1gb, so I have to tailor a playlist for it to fit that space, but it works fine. My daughter bought me a 4th gen nano (the one that's square and fits on a wristband) a few years back, and I listen to audiobooks on that while I'm riding on the bus. It also means I can say that I have an Apple watch, because it comes with interchangeable watch faces. I bought a 6th gen Touch as a treat for myself on my 65th birthday. I think those three will cover my music and audio book playing needs for the forseeable future. Not for old time's sake, but because one plays in my car, my kid has one and I carry one to keep everyone around me safe. I recently dug my older 4th gen clickwheel out and replaced the no longer functioning 40gb hard drive with a 128gb sd card and a new battery, this also had the side effect of lightening the weight of the iPod. Now it's in my car riding shotgun as my audiobook iPod. Might have to dig out the wife's old mini and do the same thing. I have no idea what generation my iPod is! It has a round wheel, a screen and so many gb's I've never gotten past 1/4 full. I've probably had it for 15 years. It has all my music and at least 4 books on it all the time. It goes with me in the car and in my sewing room when I am quilting. My husband teases me about having all my electronics with me when I leave the house! I'm thinking of buying another one to keep in reserve, although I know many people that have all the same stuff on their phones. Did you do the replacing or have someone else do it? That sounds like a good idea. By myself, it was really easy.